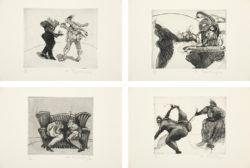 William Kentridge, from Domestic Scenes (1980), etchings with soft ground and aquatint, each from one copper plate, images varying 11.5 x 13.5 or 16 cm, sheets varying 28.5 x 38 cm. Edition of 30 incomplete. Printed and published by the artist, Johannesburg. President F. W. de Klerk freed Nelson Mandela from 27 years of imprisonment in 1990. South Africa’s rapacious apartheid system finally buckled in 1994 after the first free and democratic elections in which the African National Congress took power, appointing Mandela as president elect. Across the world, a bonfire of hope took light. In the court-like setting of the Truth and Reconciliation Commission (1995–2002), Archbishop Desmond Tutu sought restorative justice through publicly airing experiences of trauma from both victims and amnesty-seeking perpetrators. Some testimonies were projected live on national television and radio, but despite such laudable achievements, traumatic memory, of course, persists. Kentridge acknowledges that there are no such things as clean endings in history, and he makes art that tows beauty out of suffering and ties social injustice to personal responsibility. A screenprint theater poster from 1976, The Fantastical History of a Useless Man, presents the young artist’s glumly ironic response to witnessing brutal injustice. He blocked out the simplified shapes of three distinguished-looking white heads sourced from various historical periods, using a reduced palette printed on brown paper. The poster sums up of a sense of impotence residual in many white South Africans at that time and beyond. It is a fractious relationship, but Kentridge needs his home city of Johannesburg as a different kind of rock. Africa’s richest city provides an arena for his catholic cast of local characters, recurring shapes and forms that turn in gyres around subjects far grander than themselves. Kentridge knows that the way to engage in an abstract theme like traumatic memory is through the particular. People can only identify with the personal. But unlike James Joyce, who gleaned fiction from the streets of Dublin while living in Switzerland and France, Kentridge remains tethered to his riven country, living and working in his father’s house in the forested neighborhood of Houghton. His home studio, hidden by lush vegetation where ibises stroll by, is the laboratory for inceptive drawing, collage and print work. A second, much larger public studio sits in downtown Johannesburg and is the social space where his kinetic sculptures, theater and opera rehearsals, films and other large-scale productions are built. But behind the hubbub of these grand multimedia endeavors lies the persistent, quiet medium of print. 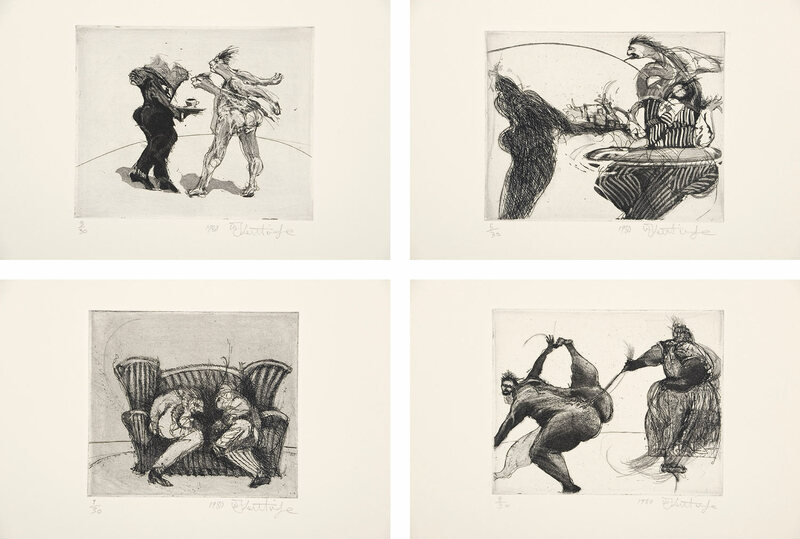 William Kentridge, from Copper Notes, States 0-11 (2005), series of 12 drypoints in progressive states, burnished and some with engraving, image 16.5 x 20.7 cm each, sheet 28.5 x 33 cm each. Edition in varying numbers for each state of the series of 12 prints. 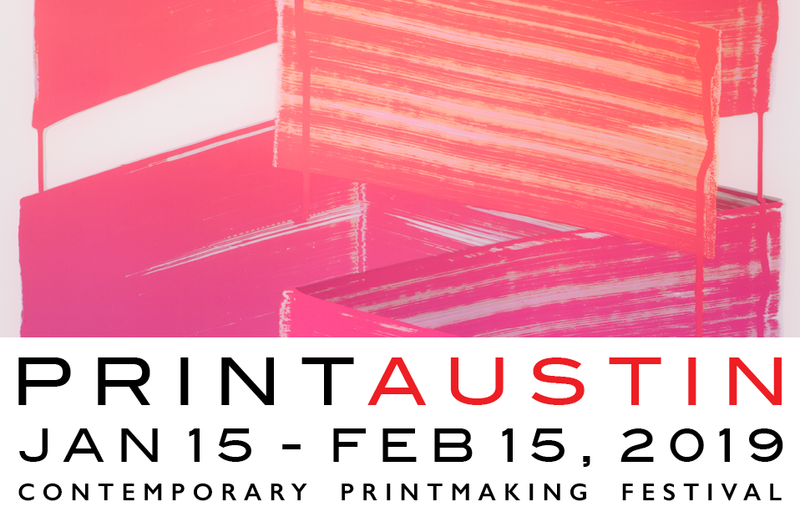 Printed by Tim Foulds, Artist Proof Studio, Johannesburg, Published by the artist, Johannesburg. 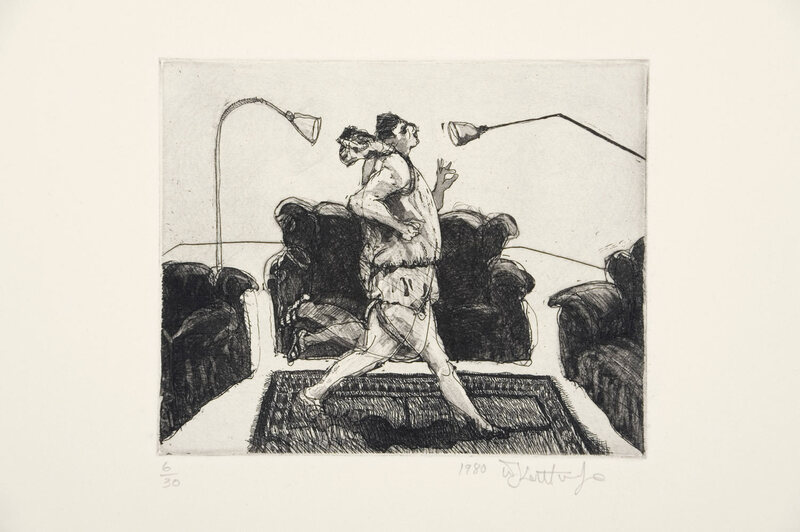 An early suite of 40 etchings, Domestic Scenes (1980), exemplifies Kentridge’s indirect approach to the apartheid rock and its larger associations—the domestic arena was the chief place of contact between blacks and whites. The prints were made in conjunction with a Junction Avenue Theatre Company play, Dikhitsheneng (The Kitchens), setting a pattern where printmaking would provide the joinery in a broader overall design. 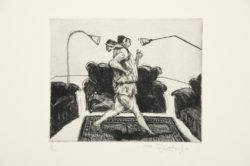 Though he failed to complete the edition-—“to do thirty prints seemed like an act of hubris,” he observed4 —Kentridge printed the plates himself, wiping a pale gray plate tone around the isolated shapes realized in softground and aquatint. In these gently satirical images, we observe a world of rotund black maids carrying parasols, serving endless cups of tea and fluffing out towels for their poolside masters. The artist’s profile appears, sharpening questions about his relationship to the legions of black nannies, night watchmen, cooks and cleaners that serviced Johannesburg’s elite. At the same time, we see him playing with multiple lines and sequential progressions, querying the depiction of movement on a flat surface and prefiguring the animation work to come. 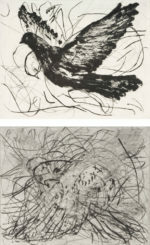 William Kentridge, The Magic Flute: Doves (2007), two from the suite of 10 prints in progressive states, drypoint and carborundum, images 19.7 x 24.7 cm each, sheets 38.8 x 43 cm each. Edition variable. Printed by Jill Ross at the David Krut workshop, Johannesburg. Published by David Krut, Johannesburg. A scene from one of these animations, the fifth Drawing for Projection, History of the Main Complaint (1996), illustrates the specificity of these erasings. We see Kentridge’s antihero, corporate magnate Soho Eckstein, driving through lashing rain; his melancholy eyes (the artist’s) are seen in the rear-view mirror, glancing back at the black broken shapes of bodies strewn along the road. The swipe of the eraser echoes the rhythmic swish of the windshield wipers, erasing charcoal, raindrops and victims, leaving contours en abyme. Kentridge’s removals—whether negative marks rubbed out of charcoal dust or burnished out of drypoint barbs—are never eradications. Kentridge’s imagery shifted from the overtly sociopolitical as South Africa settled into ANC rule and the challenges of life in the wake of apartheid. 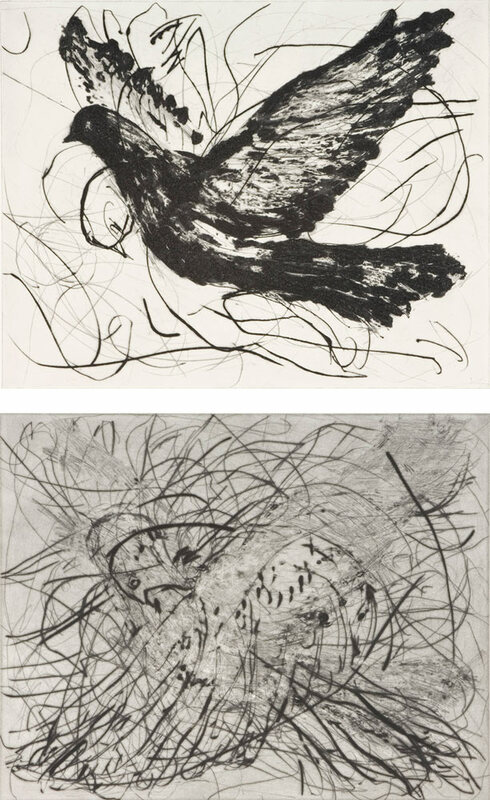 Two sets of prints that query the perseverance of memory using different imagery are Copper Notes, States 0–11, a series of 12 drypoints made in 2005, and The Magic Flute: Doves, ten intaglios linked to Kentridge’s 2006 adaptation of Mozart’s opera. Both suites were conceived as animations in copper; all were printed from the same plate, on which a sequential drawing was reworked and altered, pulling states at selected points in a kind of kinetic copper sketchbook. William Kentridge, detail from Portage (2000), chine collé figures on multiple spreads from Le Nouveau Larousse Illustré Encyclopaedia (ca. 1906), on paper folded as a leperello, image 27.5 x 423 cm, laid flat, portfolio 29 x 25.5 x 2 cm. Edition of 33. Printed by Mark Attwood, Paul Emmanuel and Joseph Legate, The Artists’ Press, White River, South Africa. Published by the artist, Johannesburg. In The Magic Flute: Doves, Kentridge yokes the image of a bird in flight to the flow of line. The dove belongs to Papageno, the opera’s buffoon and comic relief; the line belongs to Kentridge. For the first state, a dove was painted in black carborundum, poised to fly; a hint of a second figure hovers behind. By State VII, all traces of carborundum have been burnished away, leaving the faintest outline of folded wings, offered in the softest of grays; darts of frustrated movement flutter about. In State VIII, the dove is made solid again in reworked, heavy drypoint; a beady eye looks out. In the final state, the background pentimenti are grayed out into a filigree history of the process. A rooted dove sits on top in thick drypoint, trapped within the boundaries of the copper plate, its flight aborted. By leaving the history of his marks in evidence, Kentridge “thickens” or slows down time and calls attention to its disappearances.10 If art can give, it can also take away. The subject that walks through Kentridge’s oeuvre most persistently is that of a beleaguered and slightly seditious procession marching in profile. 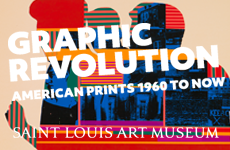 Such processions tramp through his films and installations and also across many of his prints, most strikingly the panels of his 14-foot-long (when unfolded) leperello book, Portage (2000). To make Portage, disjointed, silhouette figures were torn from black Canson paper and chine colléed to pages from the Nouveau Larousse Illustré Encyclopédie (ca. 1906). (To complete the edition, about 6,000 torn black fragments and three volumes of the encyclopaedia were used.) 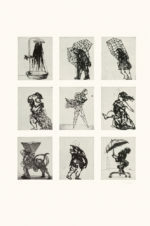 The solid shapes we see in the collage are the manifestation of shadows cast by Kentridge’s stock troupe of characters. The treeman, Harry the tramp, pylon man, umbrella man, bowler, Sisyphus, the Ingoma Zulu stomper (the Ingoma is a frantic Zulu dance involving impressive high kicks, usually performed at transition ceremonies), the flag bearer, the political leitmotif of the porter and Tatlin’s Monument to the Third International (Kentridge’s personal symbol for hope) are drafted into this line dance of the downtrodden, an exodus set in motion by unnamed exterior forces. These marchers are puppet-inspired, gimcrack assemblages of children’s toys, household objects and quotations drawn from the urban landscape such as advertising boards and pylons. 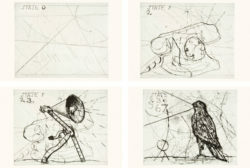 William Kentridge, Small Atlas Procession (2000), set of three etchings, each from one copper plate on a map spread from Steilers Hand-Atlas (Gotha: Justus Perthes, 1906), image 43.6 x 35.5 cm, sheet 53 x 45.3 cm. Edition of 24. Printed by Malcolm Christian, The Caversham Press, Howick, KwaZulu-Natal, South Africa. Published by the artist and Malcolm Christian, Johannesburg. Kentridge has ripped up many revered texts on which to set his troubled figures, among them a copy of Hobbes’s Leviathan from 1651 and a 1750 copy of the Christian tract De Peccato Originali. These aged texts lay an abstract road of printed linguistic knowledge beneath his marchers, allying the two realities of the concrete and the allusive. “Chance” juxtapositions between text and image arrive, cajoling us: In one example of Portage, the shadow marchers tramp over the Larousse entry for filer, a French verb whose many meanings include to “make off” or to “take leave.” Two pages along, the head of a marcher sits under the illustration for a lave-pinceaux, a paintbrush cleaner used when making art. But self-reference aside, the undercurrent is darker: Kentridge persistently pulls thought toward one of his key substrates: Does the quest for knowledge result in barbarity? William Kentridge, Zeno at 4am (2001), nine etchings on one sheet with sugarlift aquatint, from nine copper plates, each image 24.5 x 19.8 cm, sheet 98.2 x 81.8 cm. Edition of 12. Printed by Maurice Payne, New York. Published by David Krut, New York. Kentridge dreamed up the three Small Atlas Procession etchings (2000) after spotting a sketch from the school of Rogier van der Weyden on display at the Metropolitan Museum of Art. This curious drawing, Men Shoveling Chairs (Scupstoel, 1444–1450), is a design for an ornamental capital and aligns male figures (indeed shoveling chairs) around a half circle. Kentridge began placing his own parading figures on arcs, then extended those arcs into complete circles without a beginning or end. With a nod to Tiepolo’s taste for spreading characters around the margins of ceilings, he wraps his figures around the circle as if walking inside a wheel. He also quotes expressly from Goya’s ceiling painting on the miracles of Saint Anthony painted inside the dome of the San Antonio de la Florida chapel in Madrid (1798). But in these prints, unlike the peachy celestial spaces of the masters, Kentridge fills his central oculi with the terrestrial printed world of maps torn from a 1906 Steilers Hand-Atlas. For Kentridge, Tiepolo’s and Goya’s painted visions of achieved paradise represented an inadmissible state of grace that belied the misery he saw around him in South Africa, in history and everywhere else. On one tondo, figures stand on the outer rim, heads toward the center; on another, they pace the smaller inner circle, heads directed outwards to flip our vision back and forth, telling us that there is no up or down and that all is reversible. 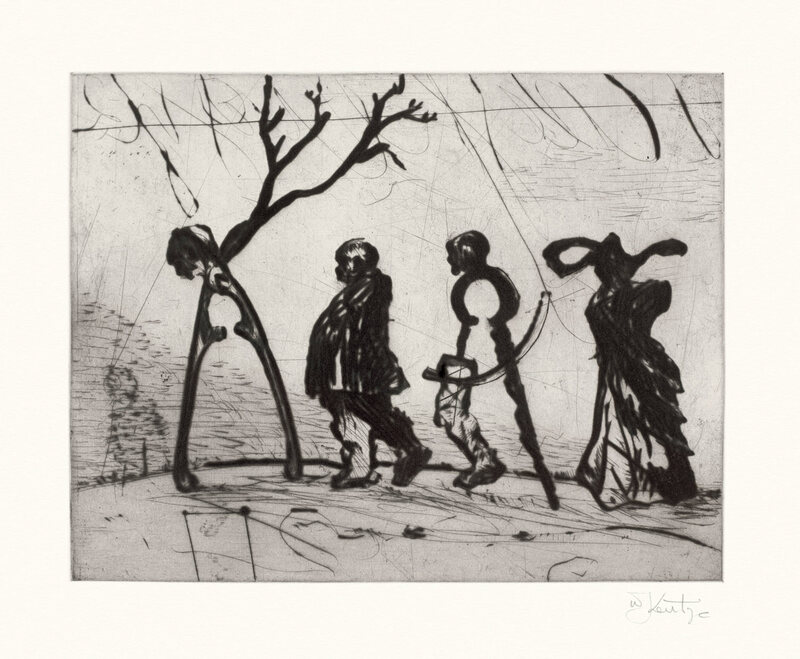 In the nine Zeno at 4am etchings (2001) Kentridge brings each member of the procession to life on its own page in loose sugar-lift aquatints. The shower and coffee grinder/meat mincer stand still; the caged man, caged woman, telephone lady and dancer move to the left; while the pylon lady, wrapped man and cowed figure nailed to his umbrella-on-wheels move to the right. These are concentrated, poised works that overturn Kentridge’s purposeful rejection of lyricism—quiet moments of virtuosity. A last example of procession is the drypoint Four Instruments (2003). Here a nutcracker with antlers leads a pinstripe-suited businessman (Kentridge’s shorthand for Soho Eckstein), a sextant with a prosthetic leg and a skirted coffee pot, all going nowhere in particular. The print concentrates Kentridge’s taste for absurd anthropomorphizing and the fusing of commonplace objects, particularly those of the predigital era, whose mechanisms lay exposed to the eye: the desktop rotary phone, the typewriter and the Bialetti Moka espresso pot—so satisfying and consequential to draw. These outmoded things are talismans that recall the clear-sightedness of childhood; he draws the outside of them as if it were their soul, unsentimental and poetic at the same time. 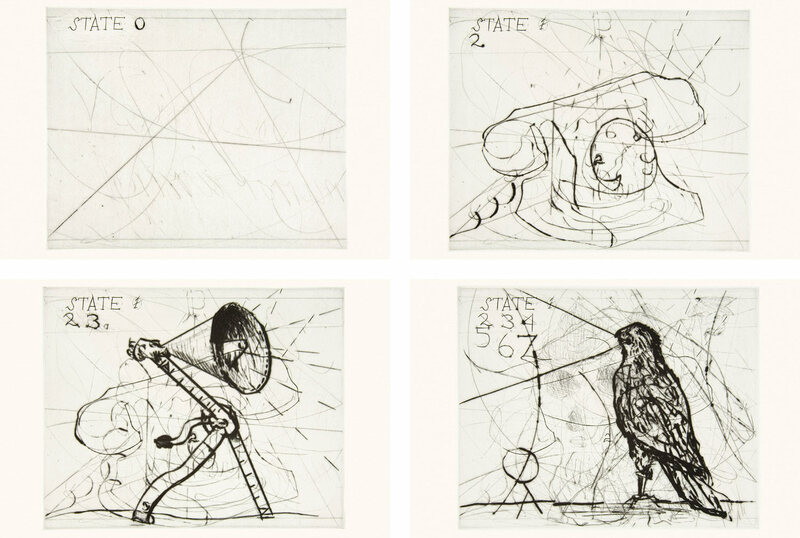 William Kentridge, Four Instruments (2003), drypoint from one copper plate, image 21.5 x 27 cm, sheet 39 x 52 cm. Edition of 40. Printed by Randy Hemminghaus, Galamander Press, New York. Published by David Krut, New York. Journey to the Moon, a film from the series 7 Fragments for George Méliès (2003), introduces the celluloid presence of the artist and gives a rare look at the loneliness of the artist/magician longing to escape the studio. Kentridge squints through his espresso cup at shadow figures stepping across a paper plate moon, among them his naked wife, Anne. He shifts paper fragments across his table, he spills lampblack ink and watches ants trek through sugar trails—scenes that seem in one moment to describe a universal condition and in the next to be simple statements of the particular minutiae of studio life. One of the strengths of his work lies in the acknowledgment that indecision, struggle and fiddling are the inevitable underpinning to the sensuous drawing and filmmaking we see. 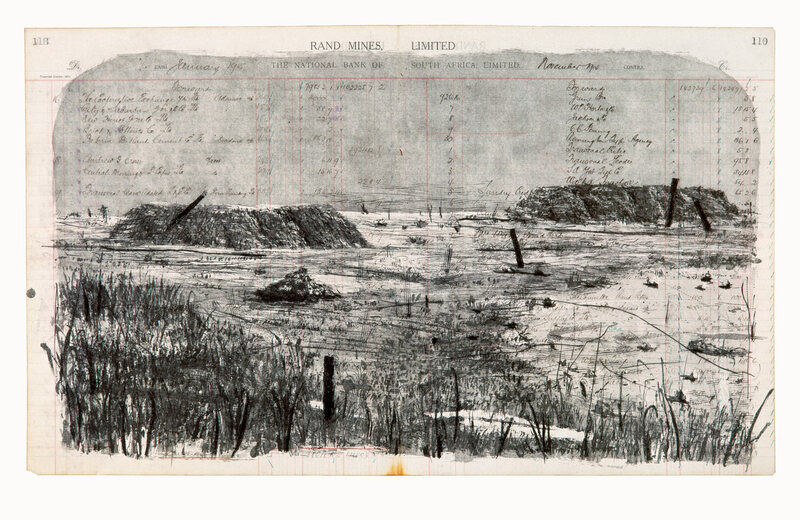 Back in 1999, just a few years after the demise of apartheid, Kentridge made Rand Mines, an etching of a desolate landscape printed on pages from the 1913 ledger of a Johannesburg mining company. The prompt for the drawing is unexpected: a reproduction of Meindert Hobbema’s The Avenue at Middelharnis (1689) on the cover of a book given to him by his grandfather. As a child he had been fascinated by Hobbema’s muddy road in its unassuming familiarity. Johannesburg is a young city built for its geological treasures rather than any natural beauty, but it sits close to the heart of lush, beautiful Africa. Like Hobbema, Kentridge chose the nondescript; in Rand Mines he drew the slag heaps, posing the question of how much of Kentridge’s Johannesburg is Kentridge, and how much is Johannesburg. William Kentridge, Rand Mines (1999), etching, softground, aquatint and drypoint, from one copper plate, on spreads from a ledger of 1913, image 37.2 x 62.3 cm, sheet 55.8 x 79.6 cm. Edition of 24. Printed by Malcolm Christian, The Caversham Press, Howick, KwaZulu-Natal, South Africa. Published by Malcolm Christian. Kentridge does see blood in the soil. Through the stipple of aquatint sky in Rand Mines, the jottings of the old mining corporation and its perpetrators can be read. The elegance of the script is balanced against the artist’s spiky drypoint markings denoting stakes and reeds below. This manhandled landscape is a scarred witness to a culture; the slag heaps are memorials to the black masses, made slaves to the extraction of minerals and the enrichment of others. The landscape, in short, is a threat to disremembering. Kentridge’s work springs from a thicket of cultural and philosophical references. He sees a direct line from man’s faith in certainty and reason to violence: rationality can make such atrocities as colonial pillage, the Holocaust and apartheid possible. We have seen how he layers sequential drawing and erasure to suggest the joint presence of history and contingency; how he glues image above text to question the manipulation of knowledge: pages to be torn, just like the child’s ruptured innocence when he learns that brutality undermines all that he knows. Kentridge reminds the viewer that wrongs must not be forgotten. He shows us how he, and we, must unforget.